I brought this product and fell in love with it. We have a inside cat and dog and you can not smell them in our house not even the spots they have done an accident. I am one very happy customer and will be buyung more. This product is a simple and easy to use foam that is simply sprayed over your rugs and carpets then vacuumed over for fresh, clean smelling carpets and rugs. We have an elderly dog that is mainly inside and the carpet deodoriser used once a week is enough to deter his “dog” smell from any of the carpeted areas. Great value and would highly reccomend. 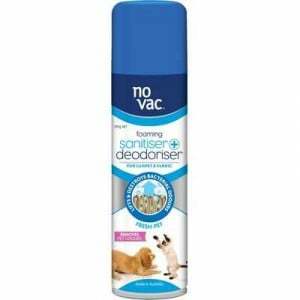 How would you rate No Vac Sanitiser & Deodoriser Carpet Fresh Pet?